Print size: 8.5 x 11" size paper, image size is 8x10". (recommended frame size to use: 8.5x11" document frames; or 11x14" frames with 8x10" mats). Prints only, Frames NOT included. 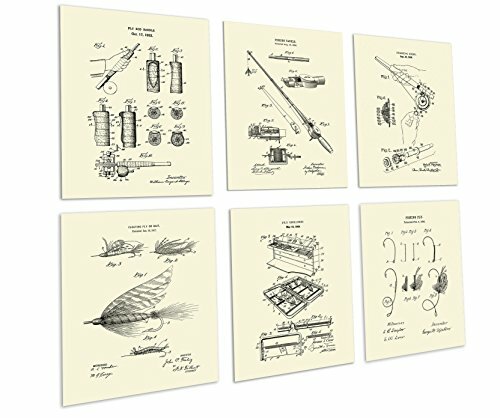 When framed and displayed together, this will make a nice fly fishing decor or as a unique gift for someone who loves fly fishing. ATTENTION Dear Customers: Please make sure the seller is "Gnosis Picture Archive" before you buy. Gnosis Picture Archive is the manufacturer and sole authorized seller of this set of copyrighted art prints. This listing description only applies to prints sold by Gnosis Picture Archive. Sometimes other sellers use our listing to sell their own unrelated products, if you buy from any other sellers you will not receive art prints as described. If you have any questions about this product by Gnosis Picture Archive, contact us by completing and submitting the form below. If you are looking for a specif part number, please include it with your message.